But to a conservative blogger, China is a gift that keeps on giving. 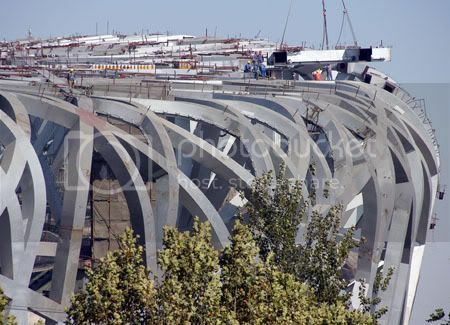 Ai Weiwei, considered one of China’s foremost architects and co-designer of the Bird’s Nest National Stadium, said he feels “disgusted” that the $400 million stadium he helped design with Swiss architects Herzog and de Meuron has become a proud symbol of China’s development. He told Reuters, “I’ve already forgotten about it. I turn down all the demands to have photographs with it. I’m not interested. I would feel ashamed if I just designed something for glamour or to show some kind of fake image”. The designer’s personal experience includes being raised in a labour camp after his father, regarded as one of China’s finest modern poets, was purged in the 1950’s after being denounced as “an enemy of the state and a rightist”. Ai said, “I spent five years with him at a labour camp where he cleaned toilets, but these stories become so catchy today. I have my own problems”. Ai reportedly likened China’s embrace of the Olympics as “pretend smile”. He said it was “kind of fake smile which is disgusting…so I hate this”. Ai is not saying this from the protection of some far off and free haven, but from his home in China. Is he brave? Too sick of it all to care? Feeling immune? Feeling foolish? Can China get away with its usual brutish tactics on someone so visible, so closely tied to this symbol of the new [?] China? This race isn't over yet; we'll see how it turns out.